Following extensive research, I found that through this last half century, no example of a knife commonly called a "Kenansville” has been discovered that which had a Louis Froelich/CSA Armory maker mark. Nor have any been discovered bearing the Roman Numerals so often found on Froelich products. After canvasing the old time Kenansville site relic hunters, I found that no one had ever found a part of a "Kenansville” knife in the vicinity. Over a period of time, I discovered a Burger Brothers marked example of the distinctive knife known as a "Kenansville Clip Point D Guard”. I also found a Boyle and Gamble marked example without its scabbard, and I found a Boyle & Gamble marked example with the original tin scabbard. The tin scabbard exhibited the traits of the known Boyle & Gamble tin scabbards. In the National Archive files I found receipts for hundreds of "Artillery Knives” made by Burger/Boyle & Gamble. In my own mind, the above information was enough to convince me that Burger/Boyle & Gamble made these knives. However, changing 50 years of public opinion cannot be undertaken lightly so I did not disclose my findings and kept looking for more confirmation. That confirmation came in the form of a knife captured from Samuel Wilson of the Goochland Light Artillery at the Battle of Carnifex Ferry. On September 10, 1861 the battle was fought throughout the afternoon. The Yanks were repulsed at dark, and Confederate forces withdrew during the night. The Yankees advanced the following morning to claim the camp. At the time of the battle, Samuel Wilson was in Captain Guy’s Goochland Light Artillery. I find no record of him having been captured in the battle, so the knife must have been left in the camp during the retreat and the label identifying its time (9/10/61) and location of capture put on it by the captor. We have invoices for many "Artillery Knives” by Burger/Boyle. No doubt in my mind this local Goochland County company was issued these "Artillery Knives”, though I do not have their particular invoice. Most of Burger Brother’s and Boyle & Gamble’s products are unmarked; fortunately they did mark enough of each type of weapon for the modern collector to readily identify their unmarked products. The Burger/Boyle D Guard knives are the most encountered identified knife of the War era, however the company’s clip point version is extremely rare. To the best of my knowledge, only two are known in their original scabbards, and perhaps as many as four more without scabbards are known. This particular example has an interesting history. Well known old time collector John Frawner purchased it many years ago from the Virginia Sergeant at Arms to the House of Delegates, an elected official responsible for attending to the comfort of legislators and for policing the chamber. He places the House mace before the speaker’s podium at the beginning of every session. According to John "the knife had been found in the Capitol belfry and was displayed in the Sergeant at Arms office for many years”. The twenty inch knife’s condition is stellar, the metal still retaining a large part of its original browning. It has never been re-sharpened or repointed, and the guard is as tight as when it was made. 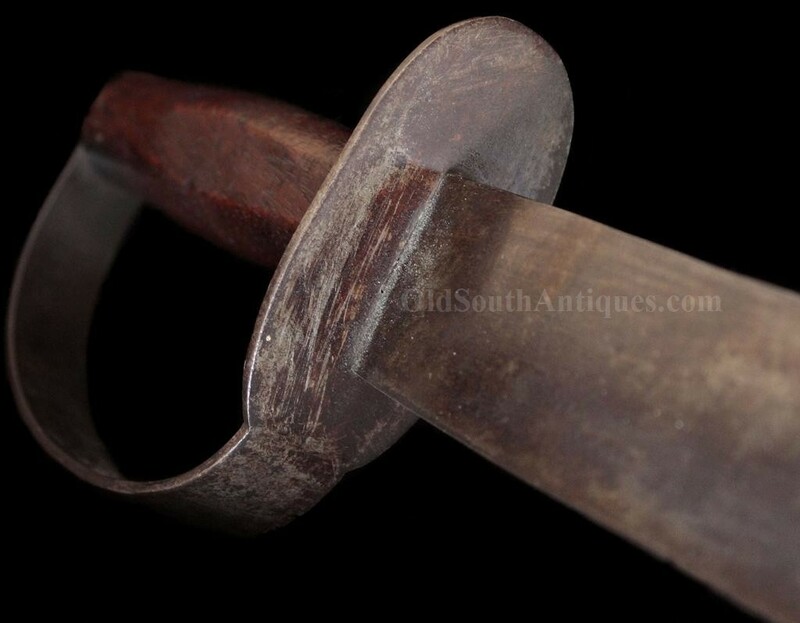 This is the exact knife shown on page 78 of Confederate Bowie Knives by Phillips and Melton. This is one of the most desirable D-Guard knives of the Confederate era. Flawless!